Bill Wasik is a senior editor at "Wired Magazine" and was previously a senior editor at "Harper's Magazine." 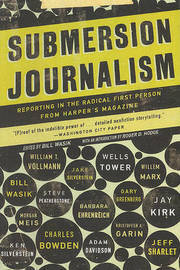 He is the author of "And Then There's This: How Stories Live and Die in Viral Culture"; a co-author, with Monica Murphy, of "Rabid: A Cultural History of the World's Most Diabolical Virus"; and the editor of "Submersion Journalism: Reporting in the Radical First Person from "Harper's Magazine (The New Press). He lives in Oakland, California.